A FREE event following select Friday night Mainstage performances. This is a fun opportunity for our patrons to get to know our wonderful performers just a little bit better. Each actor who joins us at ABT brings with them many talents, and our Cabarets give the actors a forum to shine for you! This is an event tailored for adults. Although we welcome the opportunity for children to attend, please note that both adult situations and language may be associated with various selections. PARENTAL GUIDANCE is suggested. 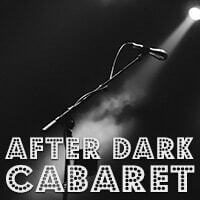 We look forward to seeing you at the next After Dark Cabaret!